Unique to Tibetan Buddhism is the institution of the tulku (incarnate lama): Tibetan Buddhists believe that compassionate teachers are reborn again and again, in each lifetime identified when they are children and invested with the office and prestige of their previous rebirths. Tibet has had many such lamas, the most famous of whom is the Dalai Lama. The Fifth Dalai Lama became ruler of Tibet in 1642, and under his rule was built the great palace of the Potala in Lhasa, the country’s capital. Tibet was incorporated into China in 1951, and the present (Fourteenth) Dalai Lama went into exile in India in 1959, when the Tibetan diaspora began. Since that time, Tibetan Buddhism has become of increasing interest to people throughout the world. As a non-sectarian Tibetan Buddhist practitioner in the Gelugpa tradition, I started my Buddhist studies at home when I was young, reading my mother’s books on Buddhist philosophy. I eventually found myself learning formal meditation at the Rochester Zen Center, with the guidance of my grandmother, who is an avid Zen Buddhist practitioner. While I was at the Rochester Zen Center, I began to study some of the major Tibetan texts and began to seek out a Tibetan Center to practice at. I then became a member of the White Lotus Buddhist Center in Rochester NY where I met my current tutor, Khenpo Monlam, and have been training in the Drikung Kagyu tradition. I also study at the Namgyal Monastery in Ithaca NY, taking part in weekend intensive retreats with visiting lamas, and receiving simple instructions from the resident monks – all in the Gelugpa tradition. I have also had the great fortune to have received teachings and empowerments from some of the great Tibetan masters of our time, including His Holiness the 17th Gyalwang Karmapa (Orgyen Trinley Dorje) His Holiness the 41st Sakya Trizin (Gongma Trichen Rinpoche), His Holiness the 42nd Sakya Trizin (Ratna Vajra Rinpoche), His Eminence Garchen Rinpoche, His Eminence Bardor Tulku Rinpoche, and Khenpo Pema Wangduk. And my root teacher is His Eminence Kyabje Lama Thubten Zopa Rinpoche, (Lama Zopa Rinpoche for short) co-founder of FPMT (Foundation for the Preservation of the Mahayana Tradition), and one of the most accomplished, and beloved Buddhist masters of our time. I am a very simple practitioner, but I am willing to pass on what little I know. 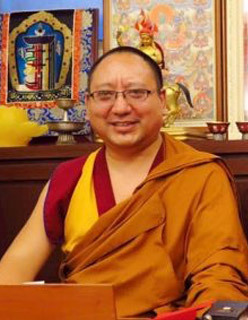 Khenpo is a title, roughly meaning Abbot, and it requires 12 years of formal study in a monastery, and is achieved through rigorous tests of debate, ritual demonstration, and text memorization, and was bestowed upon Khenpo Monlam, by His Holiness Chetsang Rinpoche (Head of the Drikung Kagyu school of Tibetan Buddhism). Khenpo Monlam is a highly trained, and well-educated lama, and is one of the head teachers at the Kagyu College in Dehra Dun India, where he has taught for 11 years. Born in Kham (Eastern Tibet) he became a monk at the age of 12, after requesting his parents’ permission to ordain. Khenpo Monlam has received many teachings and empowerments directly from one of his most well-known teachers – His Holiness, the 14th Dalai Lama. His main areas of training are: Buddhist philosophy, Madhyamika, and Tibetan grammar. Khenpo is also the author of a book on basic Buddhist teaching, written for the young monks at Kagyu College. In recent years, Khenpo has traveled the world giving teachings and empowerments, and visiting some of the great Buddhist masters of our time. Khenpo has taught in Singapore, Malaysia, Taiwan, and Germany (and India and U.S of course) at Dharma Centers that have invited him. Khenpo is also very educated in Tibetan history, the current political situation, and Tibetan culture. He also speaks several languages (at varying degrees) including: Tibetan, Hindi, Sanskrit, English, French, German and Chinese.